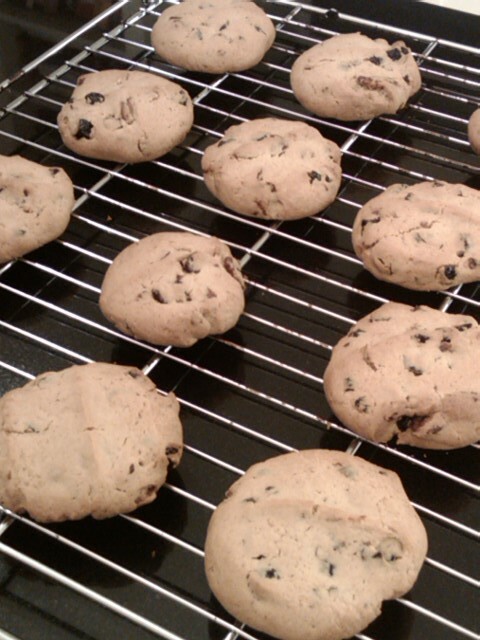 I must admit I was a bit stumped as to what to bake as I generally don’t make cookies or biscuits. In fact I don’t recall trying anything other than the gorgeous double chocolate chip cookies posted by Like Mam Used To Bake. As I was just back from holiday and didn’t have a chance to visit a large supermarket I decided to pay a visit to the local health food shop and it turned out to be an Aladdin’s Cave of wonderful ingredients for something like this. I discovered some beautiful jewel like dried Cranberries and lovely pecan nuts and decided I would make Cranberry and Pecan Cookies. I was surprised to find, after flicking through my ever growing collection of cookbooks, that I didn’t have many recipes for cookies or biscuits and in the end I used a ‘Crunchy Seed ‘n’ Spice Cookies’ recipe from a Marks and Spencer cookbook that my mum had recently given me as a starting point. 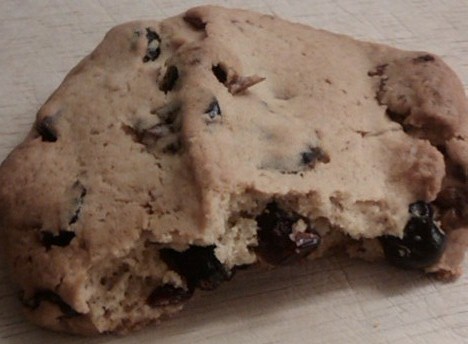 With the quantites below I made 12 large cookies – I confess they were too thick for my liking and next time I would make 20 or so thinner cookies with same mix. 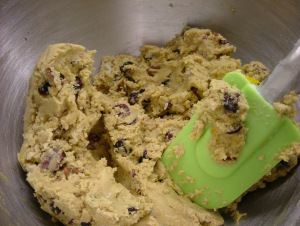 I also added a teaspoon of orange zest but I felt this overpowered the cookies and so I leave it out of the recipe below. Preheat the oven to 200ºC and lightly butter 2 baking sheets, then line with greaseproof paper. Roughly chop the cranberries and pecans but leave quite chunky. Cream together the butter and sugar until soft and fluffy. Add the beaten egg and beat thoroughly and then stir in the flour, cranberries, pecans and nutmeg and ensure they are well mixed. You should have a fairly stiff dough. Roll heaped teaspoons in to small balls with your hands and place on the baking sheet. 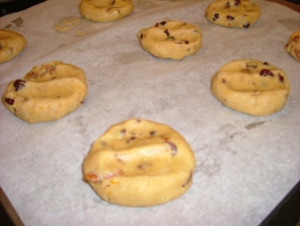 Press each cookie lightly with your fingers to flatten. Bake for approx. 15 minutes or until golden brown. Remove from the baking sheet on to a wire rack and allow to cool before eating. I was very pleased with the result and they were so simple to make. 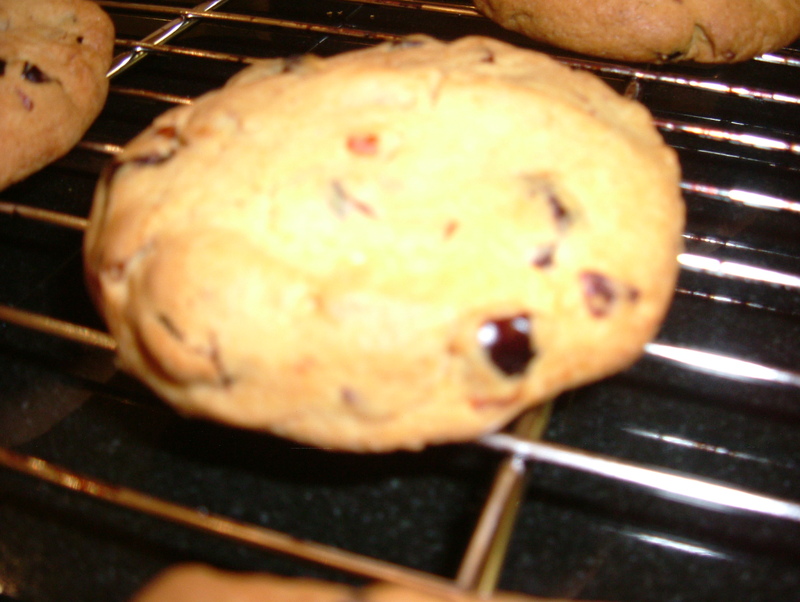 The cranberries had an amazing sweet taste and chewy texture and I will definitely make them again. Make Bake Love by Lilly HigginsIn "Cookbooks"
Almond Danish PastriesIn "Cakes and Baking"
Oh nom! I think I’ll try this, makes a change from the usual chocolatey biscuits. These look delicious. I must actually pick up some dried cranberries to have in the store cupboard as they would be nice to have with some white chocolate recipes and also to try out this recipe. Hello Rachael. Yes I definitely think the cranberries make them a health food… I like your thinking :) We have given up on excuses in our house!